the morning find us bare. For Lilian at dVerse, write a poem including the word shed, also linked to the Tuesday Platform at toads. Oh Bjorn! You can write the most romantic sensuous poetry! This is glorious. Ha.. yes yes… thank you. I will correct. I would lie if say I’m never confused about it too. I love your romantic poems, Björn, and this one is no exception – it’s exceptional, especially the very sensual: ‘shed me / skin me slowly / with an utmost care’ and ‘later, let / the morning find us bare’. 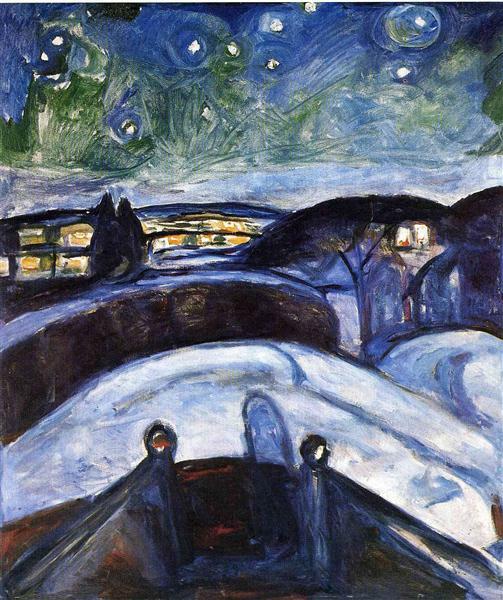 And thank you for sharing ‘Starry Night’ by Edvard Munch. I have noticed you’ve used his work a lot. He did do a wide variety. There’s a mermaid–a decorative arch that he was commissioned to do–that hanging at the Philadelphia Museum of Art. It surprised me when I first discovered it was Munch. There’s a also a drawing (I think) of lovers that’s in the collection online, but not on display. the use of the words, as verbs – shed me, followed hot on the heels, skin me — add a wonderful depth and dimension – this poem is short, tight and hot for the cold, cold for the hot – offers a delightful frisson for the softly edged song it sings – love it! I like the thought of the shy moon and the slow skinning. How can anyone resist that offer? “break my armor / even when I cry”… nice juxtaposition. First, I love the painting you’ve chosen. The poem reads like a song: shed me skin me and oh….yes! let the morning find us bare. Beautiful poem. The ultimate exposure. Do we dare to shed ourselves? Powerful and romantic. This is nicely sensuous Bjorn, with some great visuals! I love the delicate vulnerability here. And I’m holding my breath hoping that the beloved will risk being truly bare too, when even the moon cannot be an extra witness to their rendezvous. Oooh so romantic and sensual and magical! Deeply sensual words Bjorn. Very tastefully strung. The Munch painting is a great pairing for this – same mood. Very sensual. It amazes me how well you write poetry in your second language. This is an excellent poem with the shy moon and slow skinning…baring your all for your love. I love the shy moon, and the plea to “break my armor even when I cry.” Beautiful, Bjorn. I read this a couple of times as I was caught in the beauty and sensuality of the words. (sigh) One of my new favorites. Ooooooo. This is blush-worthy. So well done. Sounds like a hot night for sure! Shedding all to the bare necessities! Ooh, the vulnerability of this sensual and romantic experience is beautiful. I love this: “let me in/shed me/skin me slowly/with an utmost care”. O oh ooiu, Bjorn. Sensuous. This really is a beautiful and sensuous poem. I do not agree that lay should have been replaced by lie especially in a love poem. Lay is more fitting as we don’t want lies when it comes to love! A sensuous plea…romantic! Would it be the same if not shivering? Sultry and emotionally compelling/naked – a lovely combination. This is so lovely, I had to read it a few times as least. That was a Wow! poem! Loved it. Björn, this was beautiful! I can’t think of anything better to do when the moon is shy… or any other time.